Newborns are generally fairly easy to feed – if you offer them a bottle, or the breast, they will take it. Introducing solids can be a little tricky, but generally goes smoothly. However, once a baby becomes a toddler, meal time can become a battle. Many children, once they begin self-feeding, suddenly develop opinions and quirks and simply refuse to eat foods that do not pass their inspection. Meals shouldn’t be power struggles. However, when you are sitting at lunch with your toddler, staring them down, begging them to eat just one bite of your famous cauliflower soup, your task may seem quite daunting. You want your child to eat a healthy, balanced diet, and would it be too much to ask that they enjoy themselves while they are at it? At times, this can seem nearly impossible. Take heart, though – despite how hopeless you may feel, it is quite rare to find an adult who cries when green beans are put on their plate, or refuses to eat anything that isn’t what they had yesterday. The trick is to get past the picky stage without too many tears, on either side. Keep in mind that toddlers may have slowed down on their growth, so they simply do not need to eat as much as they used to. They are also very good at knowing when they are full, and will stop eating when they aren’t hungry any more. However, if you think your child might simply fall under the Picky Eater category, here are some tips to cheer you up. Be Persistent. A child may see a new food 6-12 times before they consent to try it. Continue to put the new food on the child’s plate, and then eat your own food before it gets cold. Don’t make a big deal out of it, just serve a small amount to them and wait to see what happens. Be Cheerful. If you try to coerce a child into trying something they don’t want, it will quickly escalate into a power struggle, and you are almost sure to lose. Nothing is more ironclad than a toddler’s will to not swallow. Be Creative. Have you ever seen a bento lunch? A hardboiled egg may not be that appealing, but a small car, made from a hardboiled egg, can be quite enticing. Try dolling up your child’s lunch or dinner, and see if it makes a difference. Be Sneaky. If your child’s diet consists of macaroni and cheese and chicken nuggets, and nothing else, then it might be time to be a little sneaky. Sweet potatoes, cauliflower and carrots can all be cooked and mashed up, then added to macaroni and cheese. Many vegetables can be grated and added to baked goods. This certainly isn’t a long-term solution, but it can at least offer you some peace of mind. Be Positive. 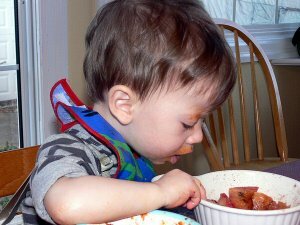 When serving new foods to a child, assume that they will both try it and like it, even if you’re not sure of either! They can see your attitude in your face, and will probably react to it. If you look resigned to throwing their lunch into the compost bin, they will most likely oblige you. Be a Good Example. Your children should see you eating varied foods, to set the example. Sometimes, food looks tastier off Mom’s plate than it does off of their own, so try offering them a nibble of your food once in a while. Be Conscientious. Even the pickiest child can’t do too poorly if their plates only hold healthy foods. Be sure to give your child nutritious options so you can at least feel good about whatever they do decide to eat. Be Observant. Sometimes a child will turn away from a food simply because they don’t like the texture of it. If raw carrots aren’t a hit, try cooked and cubed. If that isn’t interesting, try to mash them up. See what your child does like, and try to find some common ground. Perhaps a dish is too warm, too cold, too soft, or too crunchy. Perhaps your child likes things cut up into a certain size, easy for picking up with little fingers. Be Smart. Offer the new food early in the meal, when your child is still hungry. Offer it when they are in a good mood, not sick and cranky. A healthy, happy child is much more likely to be adventurous than a cranky, tired one. Be Understanding. If a child tries a food, and just doesn’t like it, that’s ok. Some families set a one-bite rule: one bite, to see if you like it or not. If the child doesn’t like it, don’t be afraid to continue to serve it, maybe in different ways. Eventually, they may change their mind. Be Proud. When a child does try a new food, give them some praise, and move on. Each bite shouldn’t inspire a happy dance, even if that’s what you’d like to do, but a simple “good job” will work wonders on their confidence.